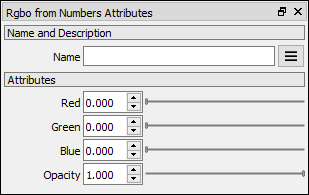 The RGBO From Numbers node allows to set the value of each channel as an input from a Number value. RGBO output: Red Green Blue Opacity. Drag the Rgbo From Numbers icon into the Node Graph.